The components cleaned up nicely! 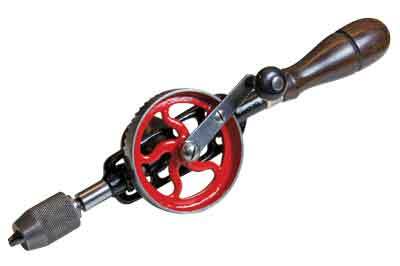 With the ready availability of cheap rechargeable drills nowadays, many woodworkers no longer use, or even own, a traditional 'egg-beater' style hand drill. 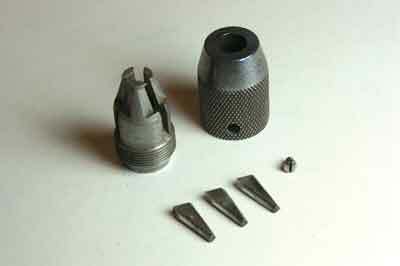 I think this is a pity as I turn regularly to my hand drills for accuracy and ease of use, when small holes are needed and the feel and control afforded by such tools makes them a real pleasure to use. I have long admired the Millers Falls No.2 and No.5 drills that were the tools of choice of American woodworkers for decades and have looked longingly at the beautiful, professionally restored versions available in the USA. However, at Â£120 or more, plus import taxes and shipping costs, this was never going to be a realistic option for an amateur woodworker, so when I found this No.5 drill for sale in the UK for Â£25, I jumped at the chance to restore it. 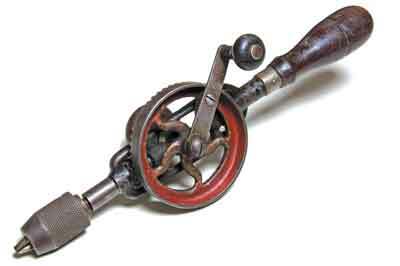 The drill is fitted with a McCoy's patent springless chuck, has the 'star' trademark on the crank, a mushroom-shaped side handle and tropical hardwood handles, all of which date it to around 1914, so I was pleased to find that it was to all intents and purposes complete and in working order. 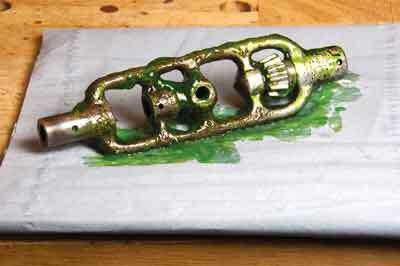 It was, however, heavily coated with grease and dirt and with little of the original paintwork left. 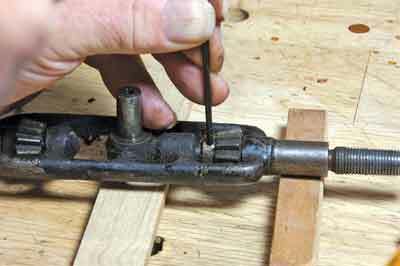 Some might shy away from restoring a 100-year-old tool or even consider it sacrilege, but this drill was not in a condition that would interest a collector and anyway, in my opinion, tools are meant to be used not displayed in cabinets. While antique furniture develops a patina with age, the brown colouration on old tools is not a 'lovely patina'. 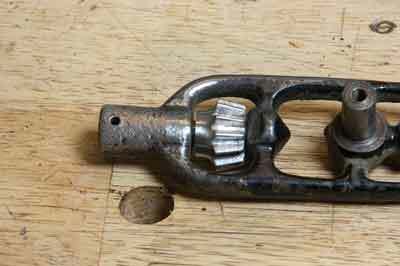 It is rust and if left to its own devices it will ultimately destroy the tool, so I have no qualms about removing it. 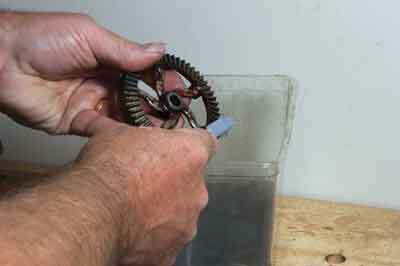 The grease and dirt in the mechanism can be clearly seen. The first job was to dismantle the tool into its component parts. 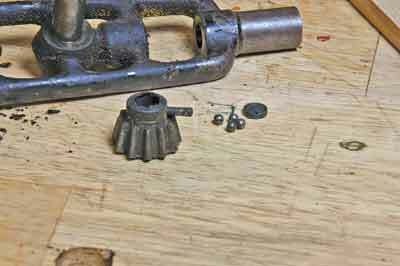 This was mostly achieved by straightforward unscrewing of components, but to remove the shaft it was necessary to drive out the dowel pin from the bevel gear with a pin punch. 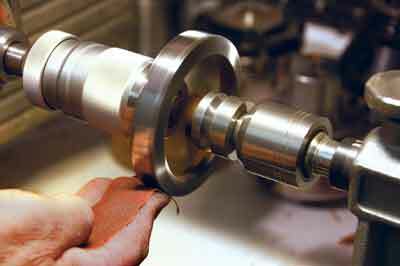 With the pin out, the shaft could also be removed, taking care not to lose the small components of the thrust bearing, which fall from their socket when the shaft is released. 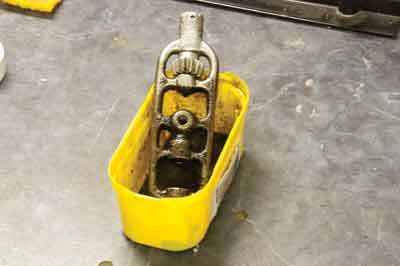 To remove the handle, two further dowel pins had to be removed before the handle could be unscrewed and the stud removed from the frame with the assistance of a suitably sized rod through the dowel hole - and a good soaking with penetrating oil. 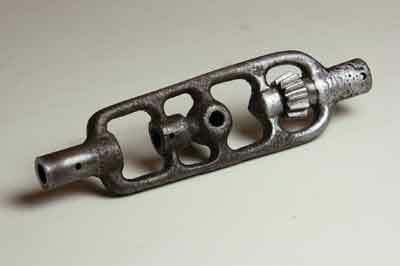 At this point the shaft on which the upper bevel gear runs should have come away freely from the frame, but as it was unwilling to do so and as I did not wish to employ unnecessary force that might cause damage, I left it in place and cleaned up the gearwheel in situ using an abrasive impregnated nylon brush. The poor condition of the paintwork and rust pitting on the frame can be clearly seen. Several applications of a proprietary paint stripping gel and some judicious scrubbing with an old toothbrush were required to remove the remnants of the finish, which unfortunately revealed yet more rust pitting beneath the paint. All the remaining metal components were given a thorough wash in a bath of paraffin - kerosene - to remove the accumulated grease and dirt. Automotive de-greaser would be equally effective. Magnetic parts trays were used to keep the smaller parts safely where they will not roll off the bench and disappear forever. 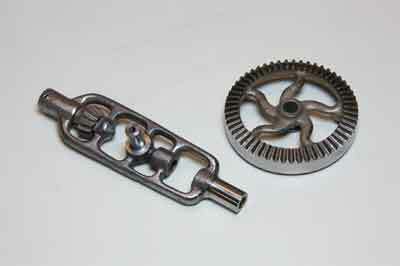 It is difficult, if not impossible to find replacements for 100-year-old parts! At this point a decision was needed about how much restoration to do - whether to go for the 'better than new' look achieved by the professional restorers, or to simply clean up the parts and reassemble. 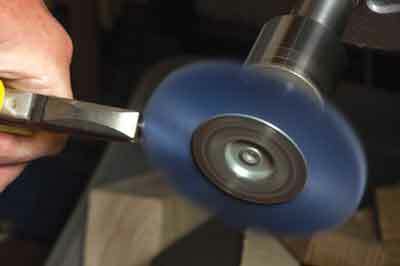 I decided to take a middle route, aiming to achieve a standard of finish that would result in a tool in the condition a careful user might have kept it. 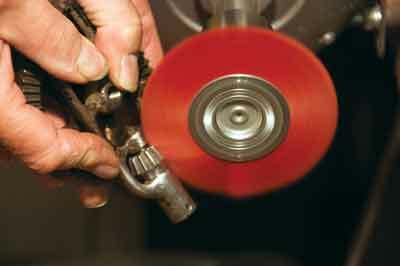 First, the hand wheel was mounted on the lathe and the 'patina' of rust removed from the rim by working through the grits of cloth-backed aluminium oxide abrasive and polishing with an abrasive compound. Once the frame had been fully stripped of finish, the full extent of the rust pitting could be seen. This needs to be removed before a new finish is applied or corrosion will continue and shorten the life of the paintwork. Several coats of rust removing gel were required to bring the frame back to pristine condition, each application followed by a scrub with fine non-woven nylon abrasive. 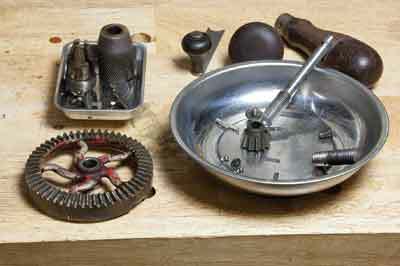 The handwheel was given the same treatment and both components given a final cleaning off with methylated spirit - de-natured alcohol - ready for finishing. The professionals would use a baked-on enamel to re-finish, but I settled for automotive acrylics - Gloss black and Ford 'Sunset' red. Careful masking is essential before spray painting. Every minute spent masking will save 10 minutes cleaning paint from where it was not wanted. 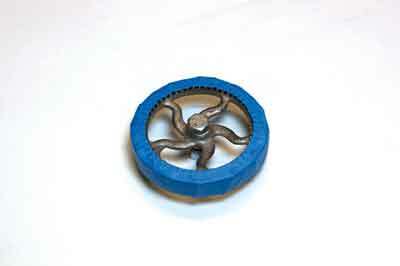 A bolt, nut and washers fastened through the centre hole of the wheel proved an effective means of masking the bearing surfaces. Masking the gear cogs was a bit more troublesome. The hardwood main handle and crank handle were in surprisingly good condition once they were de-greased, so I left them alone apart from a polish with Tripoli and white diamond compounds, followed up with carnauba wax using buffing wheels. The side handle was less well-preserved and required sanding off, staining with a mix of mahogany and medium oak stains to match the original colour and sealing with sanding sealer before it too was finished with carnauba wax. 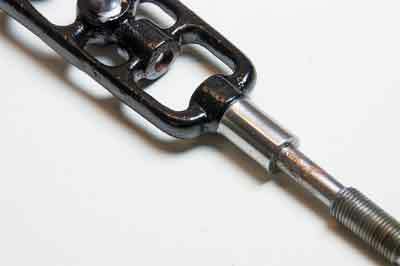 Small components, such as screws, were held with pliers to enable a thorough clean and polish using a fine abrasive impregnated nylon brush. 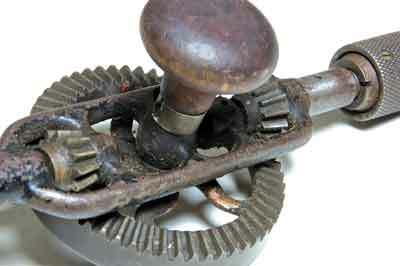 The McCoy's patent springless chuck was carefully dismantled and 100 years' worth of rust and dirt gently removed by hand, using rust removing gel and non-woven nylon abrasive. I did not want to resort to over vigorous polishing here, seeking to achieve a good clean working chuck rather than an exhibition piece. A light oiling followed. 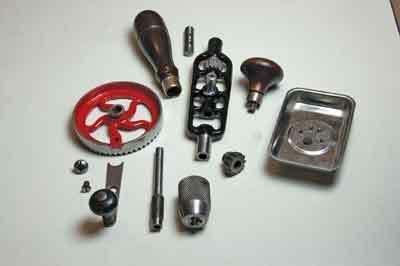 The cleaned, polished and re-finished components are now ready for re-assembly. Note: the tiny thrust bearing parts are still safely retained in the magnetic tray. 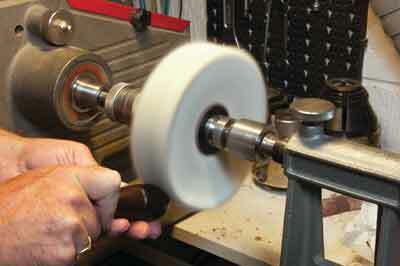 The thrust bearing was packed with high temperature copper filled brake grease, the main shaft lubricated with the same and the components carefully re-assembled. 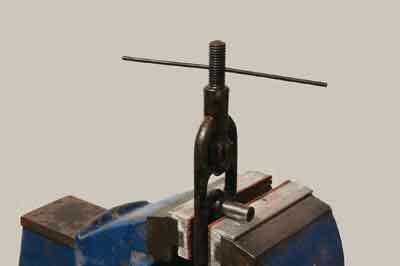 The final result is a tool which, while not perhaps as showroom perfect as the professionally restored models that I so admired, will give me and hopefully many more generations of users great pleasure to work with for at least the next 100 years.